We now consider the perspective of the defence on the translation of evidence and the interpreting of testimony. We have seen witnesses and the prosecution negotiate meaning, but the largest number of examples for the negotiation of meaning come from arguments raised or pursued by defence counsel. 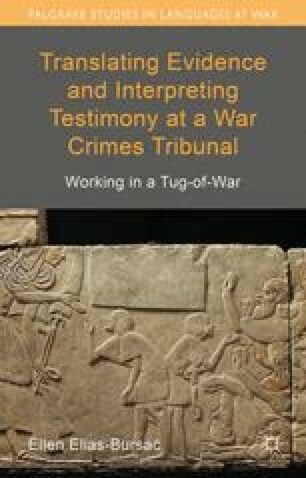 Language-based strategies are natural to the defence in international war crimes trials because, unlike the attorneys for the prosecution, at least one of the counsel on every defence team speaks the language of the accused and is in charge of monitoring the interpreted testimony and translated evidence for anything that might be working to the disadvantage of the accused.